IRCTC PNR Status - Check your booking status right now! The IRCTC must have provided you with a 10 digit PNR number in the Indian Railway tickets for the trains like Express and super fast express trains, Rajadhani trains, Garibrath, Sathabti and janasathabthi, Doronto and for other trains which come under Ticket reservation system. 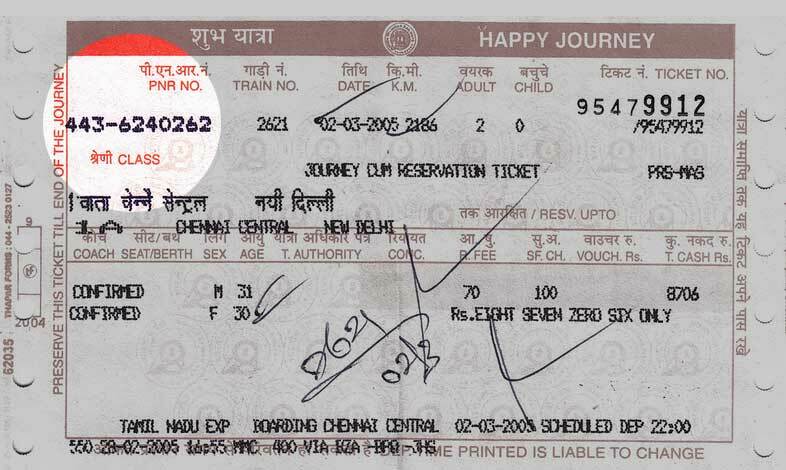 The PNR number can be seen in the top left corner of the ticket that is issued through the counter in any Railway station. In E-Tickets the PNR number will be in the right corner cell. Just type your 10 digit PNR number in the box provided and just click submit button. The PNR status checking tool will check the status of the typed PNR number in the Data base and display you the PNR status of your ticket. What does the IRCTC PNR status tells you? The status of your booked ticked is made known to you. It reveals you whether your ticket is confirmed, reserved or waitlisted etc. Sometimes you can see that your ticket comes under waiting list. You can check your PNR status in a periodic gap whether the waiting list status has been changed to the status of confirmed tickets. You can submit a request to find the PNR status through IRCTC site or through an official Indian railways site. You can use SMS service to check your PNR status. Just SMS your 10 digit PNR number to 139 and follow the instructions given. Or else SMS your 10 digit PNR number to 5676747. You can use Smartphone app to check your PNR status. PNR status app in Google play store is an Android app. You can download it and use it to check the PNR status. After all available tickets of a train is sold, the IRCTC releases RAC tickets for railway reservations. After all RACs are sold, IRCTC releases WL tickets. Almost in all the trains the tickets are cancelled for different reasons. These cancellations will make you to get inside the train, if you have got RAC or WL tickets. WL1/RAC3 is reserved ticked against cancellation which allows you to board inside the train, but you may have only seat insted of berth. WL5/CNF is confirmed ticket which allows you to board inside the train and allocates a birth for your self. If your WL ticket status is not changed into RAC till the time of departure, the cost of your WL ticket will be refunded to your bank account.